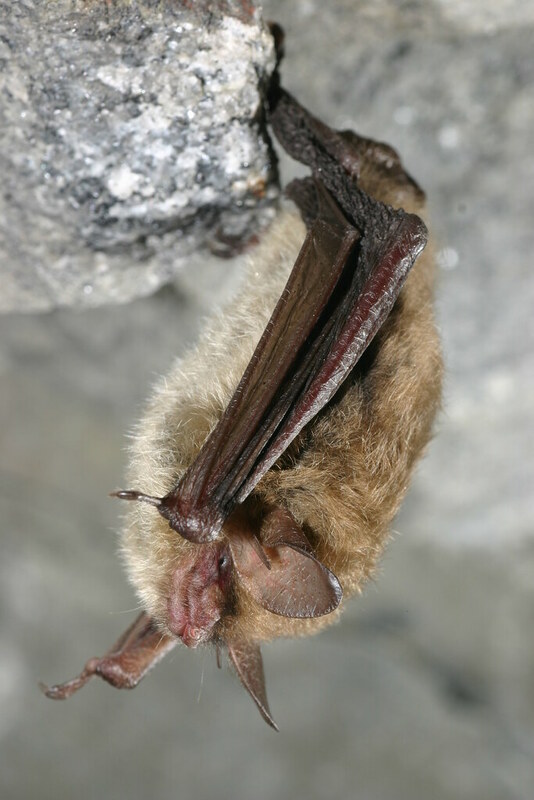 The northern bat can vary a bit in color, but it is most commonly a medium brown on the upper parts and lighter shades of brown on the underside. It reaches medium size around 3 ½ to 4 inches long with a wingspan of around 9 ½ inches. It has a common look of other bat species, but it is distinguished from other Myotis bats is the long, pointed tragus as other myotis species have a shorter, blunt-shaped tragus. These bats are found on the eastern half of North America. They are native to areas that include western Newfoundland, southern Quebec, Ontario, and Manitoba, and central Alberta, then down through the eastern United States. In the United States, these bats can be found throughout the eastern Great Plains, eastern Oklahoma, northern Louisiana and Mississippi, southern Alabama, northern Florida, central Georgia, eastern South Carolina and North Carolina, and along the Atlantic Coast. They are found all year long throughout Kentucky. In the spring, summer, and fall, these bats are found living in colonies that will roost under loose and peeling tree bark, as well as abandoned buildings, natural rock shelters, and crevices. Pregnant females will form maternity colonies during this time as well where they will give birth to a single pup. These bats hunt in open woodlands, woodland edges, along water corridors, and even on the ground where they will feed on insect larvae. When it comes time to hibernate, they will choose caves, rock shelters, and abandoned mines as well. It is typical for them to hibernate singly, but small clusters do form occasionally. They usually wiggle into rock crevices in order to maximize their body heat, but they have been seen hibernating as they hang from the ceiling or along the walls of the cave or mine.